This recipe is easily doubled, and is delicious served with gammon and any remaining turkey on Boxing Day. Place the cranberries and the juice and zest of the clementines into a small pan with 150ml cold water to cover. Bring to the boil, then simmer gently for 10 minutes until the cranberries have softened and started to burst. Add the sugar and port, and stir until the sugar has dissolved. Simmer for a further 5-7 minutes until the sauce has thickened. Transfer the sauce to a small bowl and serve warm or cold. 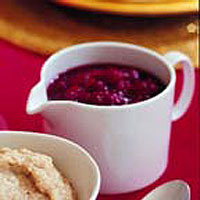 As a shortcut, use fresh Joubère Cranberry Sauce With Port instead of making your own. Make the sauce up to a week in advance and keep it in the fridge, or store in the freezer for up to 3 months. Replace the clementines with 100g thinly sliced kumquats.